Toronto: Kids Can Press, Ltd., 1995. On a dark winter’s night, a ragged beggar dreams of a warm hearth and a delicious meal—and sets out to find just that. 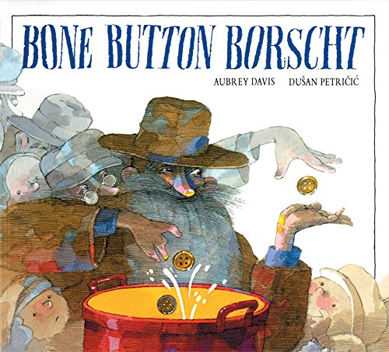 In this retelling of the classic folk tale “Stone Soup,” a stranger teaches the poor villagers what can be accomplished with a few buttons and a little cooperation. With repeated reading and reflection, this bottomless tale could teach us all a whole lot more.